Coal Mine Company Denies Responsibility Despite Disaster Settlement : The Two-Way The Labor Department says a Thursday settlement in the 2007 Crandall Canyon mine disaster clearly leaves mine owner Murray Energy with "acknowledged responsibility for the failures that led to the tragedy." The settlement must still be approved by an administrative law judge. 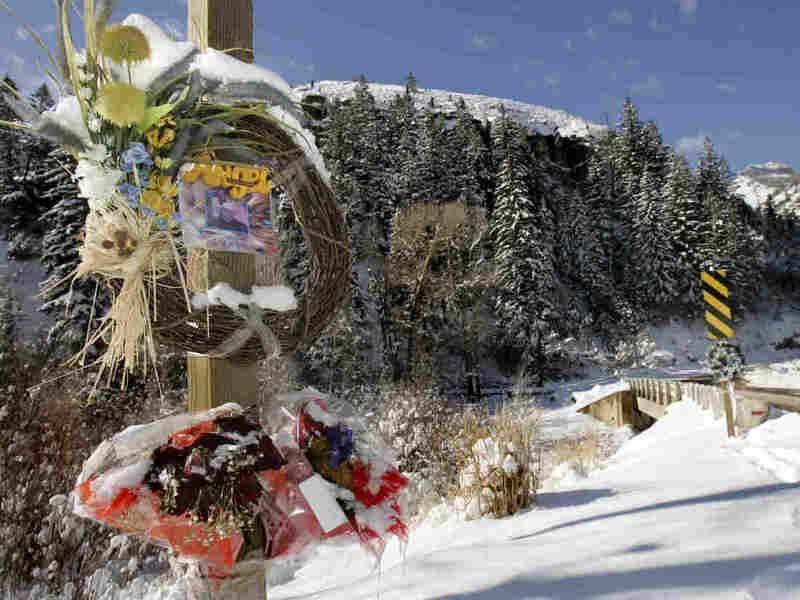 Wreaths and flowers commemorating those killed in the Crandall Canyon Mine collapse are posted at the mine entrance on Dec. 10, 2007, outside Huntington, Utah.Â A settlement Thursday includes mine owner Murray Energy's acceptance of four violations considered "contributory" to two fatal August 2007 mine collapses at Crandall Canyon. The Labor Department says a Thursday settlement in the 2007 Crandall Canyon mine disaster clearly leaves mine owner Murray Energy with "acknowledged responsibility for the failures that led to the tragedy." "These failures resulted in the needless deaths of nine" miners and rescuers, Solicitor of Labor Patricia Smith says. But despite company signatures on the settlement document, Murray Energy tells NPR "this settlement is not an admission of any contribution to the August 2007 accidents." The settlement [PDF] also reduces the Labor Department's initial assessment of $1.639 million in fines for flagrant, reckless and highly negligent violations of mine safety law to $949,351 in penalties. That's a reduction of more than 40 percent, but it's still the third-largest fine ever levied against a coal company, according to the Mine Safety and Health Administration. 1. Failure to report a "coal outburst" at the mine four days before the first fatal collapse. "The failure to report this accident," MSHA inspectors wrote, "denied MSHA an opportunity to investigate it and learn that the mining methods provided inadequate protections." 2. Two failures in March and August of 2007 to revise the mine's roof control plan after "coal outbursts" and bounces" that "caused substantial damage" showed that the plan "was not adequate or suitable for controlling" the movement and falling of rock. 3. Failure to leave pillars of coal long enough and wide enough to meet safety standards and to hold up the roof of the mine as coal was removed. The pillars "did not provide sufficient strength to withstand stresses," mine inspectors wrote, leading to "sudden and violent failure of the overstressed coal pillars" in the Aug. 6 and Aug. 16 collapses, in which nine miners and rescued were killed. Murray Energy "allowed the conditions at Crandall Canyon to deteriorate," says assistant Secretary of Labor Joe Main. The company "ignored warning signs that was encompassed by those violations that led to that tragedy." But Murray spokesman Gary Broadbent says the company "would have presented evidence that the alleged violations did not contribute to the cause or effect of the accidents" if no settlement were reached. The company settled, Broadbent says, to avoid "putting ... former employees, their families, and members of the community at large through the ordeal of reliving the tragic events." Salt Lake City attorney Ed Havas represents some of the families of the Crandall Canyon victims and says Murray Energy's statements about the settlement do not help or comfort his clients. "It's still a denial of responsibility that's hard for the families to hear and, in my view, is disingenuous," Havas says. Labor solicitor Smith says Murray's denial of responsibility "is somewhat inconsistent with accepting the citations as contributory ... so we stand by that." But a footnote in the settlement document notes that "the parties disagree as to whether the evidence which could be presented at a hearing supports the contributory characterizations of the violations." So, Murray Energy gets a settlement with a steep reduction in fines and an ability to deny responsibility. "That's quite typical in settlements," Smith adds. "I don't know any settlement where, even if you accept the citations, the company comes out and says, 'We caused this to happen.'" The settlement must still be approved by an administrative law judge overseeing the case. Earlier this year, a Murray Energy subsidiary pleaded guilty to corporate criminal charges not directly related to the disaster and was fined $500,000. The Justice Department agreed not to seek individual criminal charges against any company officials. The families of the nine victims of the Crandall Canyon mine disaster settled wrongful death claims three years ago. The settlements include non-disclosure agreements that have kept terms secret.